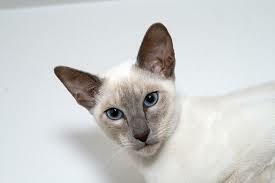 Today’s question: How to stop a kitten (or an adult cat) from biting your hands and other inappropriate things? Cat biting is a common complaint among feline owners. If you’ve ever owned a cat, you know how difficult it can be to eliminate this behavior. Dealing with a biting cat can be both annoying and frustrating. Kittens especially love to play and nibble on objects. Shoes and curtains can be easy targets for playful and fun-loving kitties. Some kittens even take to nipping on human toes and fingers as a way to pass time. 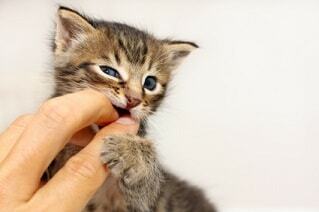 Yes, nibbling kittens can look cute when they gently chew on your fingers. Fully grown adult cats, though, can do serious damage to property and people when they gnaw and bite. So, it’s up to you as a kitten owner to train your little furry friend not to continue this potentially destructive and dangerous behavior. But how to stop your cat from biting? To stop a cat from biting, we need to understand why cats bite in the first place. Kittens and cats bite for a wide variety of reasons. In general, biting and chewing are natural predatory activities for kittens. Biting and other predatory behaviors are what cats would do in the wild to catch prey. 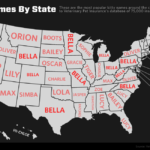 When hunting behavior is misdirected, it can become quite problematic in the home. Boredom is a key reason for biting. Imagine having lots of pent up energy, but only a few ways release it. Kittens feel this way a lot of the time. Few novel activities equals bored, chewing kittens. Not having enough toys is another reason for kitten biting. When kittens have few options in term of toys, they turn to the next best thing: your curtains or your feet. Do you set aside playtime with your kitten? Do you have little time to spend with your kitten? 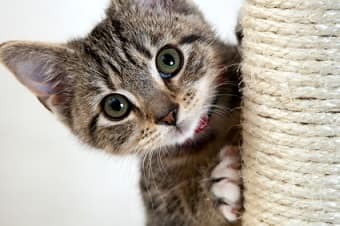 Kittens that have little interaction with their owners may feel neglected and act out by biting and chewing inappropriately. Often, kittens that have been removed from their cat mom too soon display chewing behaviors. 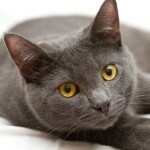 Orphaned kittens or kittens weaned too quickly miss out on crucial socialization time with their siblings and mom cat. Socialization enables kittens to learn how play without causing injury to others. Hungry kittens and cats will do just about anything to get their paws on food. I once owned a cute kitten that would nibble on my toes every morning to let me know that he was hungry and wanted his breakfast! Sick or angry felines will often bite, hiss, and spit. If you see a cat in an aggressive posture, back away and give them space. While kitten biting is not the easiest behavior to correct, you can train your kitten to stop the chewing. When training your kitten, remember that persistence and consistency are the keys to success. Cats are notoriously stubborn and strong-willed so keep up the training. Luckily, most kittens will outgrow biting and mellow a bit as they age. 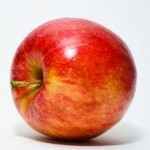 However, some adult cats will maintain biting behaviors. So, it’s best to stop kitten biting as soon as the behavior appears. Don’t treat or reward your kitten while she’s biting or after she has already bitten. Otherwise you will encourage this unwanted behavior and your cat will keep on biting you. 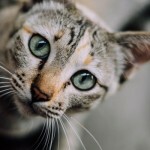 Most cats don’t like to get wet, if you’d always spray some water on your cat after she has bitten you, then she will start to associate biting with getting water sprayed on and will stop biting in order to avoid the water. As I already said above, biting is a natural behavior for cats, and they are bound to do it while playing. So, the best way to stop your cat from biting you while you play with her is to always use a toy and never your bare hands. I also said above that a cat, especially a kitten, might start to bite simply because she’s bored. To keep that from happening, make sure your cat always has some interesting toys to play with. If your cat is tired from playing or learning new tricks, she simply won’t have energy for biting. 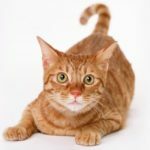 If your cat likes to chew inappropriate items, then you can use cat repellents such as bitter orange to stop your cat from doing that. This is important because if you remove your hand suddenly once it’s in a cat’s mouth; it may cause injury to your hand. Don’t have enough free time to keep your cat occupied with play time? Consider getting a second cat, so the cats can play together and keep each other away from the unwanted biting behavior. Even if you always use toys and not your bare hands, your cat might still try to bite your hands. If this happens, pick your cat up and take her to another room and leave her there for a while. This will teach your cat that if she bites your hand, the play time is over. It can really hurt when your cat bites your finger or hand, but please do not hit your cat. For one, you are a lot stronger than your little furry friend and you may seriously injure her. For two, this won’t stop the biting, in fact, the cat is likely to scratch or bite you again in self-defense. Do you know any additional tips on how to stop a cat from biting? If you do, you can share them in the comment section below.